A recent report released by Americans for Tax Fairness exposed Walmart for their evasive tax practices and revealed that the retail giant is holding over 78 billion dollars in offshore subsidiaries. Our members were quick to speak out against these practices and took to the media to make their voices heard. 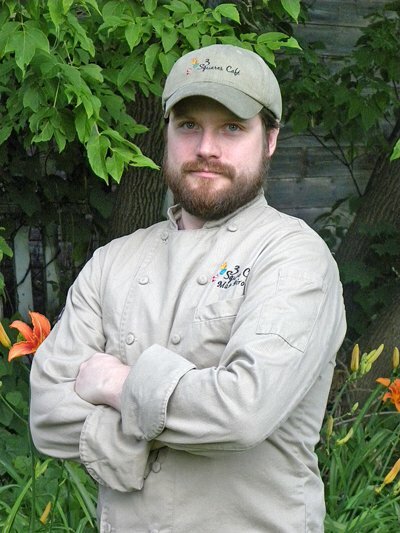 Matt Birong, owner of 3 Squares Café (a cute and comfortable spot in Vergennes, VT) and member of the Main Street Alliance of Vermont, compared the high road business practices of his company to the extractive economic policies of Walmart and other multinational corporations in his article, featured in The Hill. “Small businesses like mine are being squeezed by tax policies written for the upper echelon. Even though our revenue sheets look much different than those of the retail giant, we are forced to supplement the income of their employees and absorb a larger share of the tax responsibility,” said Birong. Kelly Conklin, a member of the Main Street Alliance national executive committee, owner of Foley-Waite cabinets in New Jersey, also weighed in on the issue and spoke about growing his business while supporting his community in his article, featured in the Augusta Free Press. “We’d rather contribute what we should to the public good and see our communities thrive right alongside our businesses,” said Conklin. Small business owners already face stiff competition from large corporations, like Walmart, that can execute bulk purchases and drive down prices. The latest tax evasion revelation demonstrates just how far the scales are tipped in favor of big businesses. Congress can act to rein-in these practices – and our leaders will continue to work to make sure their voices are heard on this issue. Sharing resources between organizations includes putting people on the ground, side-by-side. It gave me a sense that whether the work we do is statewide or on a federal level, the challenges we face are the same. 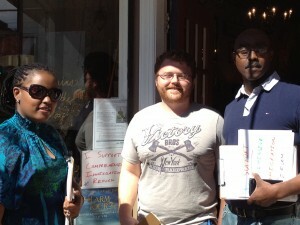 My name is Alain Nahimana and I am an organizer with Maine People’s Alliance. A community organizer can work in all environments, not only in his/her com munity. This week, hundreds of Washington state small business owners affiliated with the Main Street Alliance of Washington sent an open letter to Microsoft calling on tech giant to stop offshore tax dodging, the Seattle Times reports. According to BloombergBusinessweek, Microsoft tops the list of U.S. tech firms with the biggest overseas profit hauls, holding $76 billion in profits stashed offshore. In their letter, small business owners express their disappointment that Microsoft has joined in coalitions with other big corporate interests lobbying for a permanent tax amnesty on offshore profits – a so-called “territorial” tax system – while backing cuts to Medicare and Social Security that would wreak further havoc on the Main Street economy. Will SEC order a dose of sunlight for corporate political spending? Mary Jo White, the new Chair of the U.S. Securities and Exchange Commission, was recently confirmed to a five-year term that secures her position until 2019. With that kind of job security, Ms. White should be able to rise above the partisan pressures of Washington politics and advance a proactive agenda at the SEC that furthers its mission of protecting investors and promoting transparent, well-functioning markets. This fall a major showdown is brewing over tax and budget priorities in our nation’s capital. Senator Max Baucus (D-Montana) and Congressman Dave Camp (R-Michigan) have been laying groundwork for a rewrite of the U.S. tax code. The grape boycotts organized by the United Farm Workers in the late 1960s were part of a groundbreaking strategy to engage consumers in the fight for fair treatment for immigrant farmworkers. Fast forward to 2013, and groups in Colorado campaigning for economy-boosting immigration reform with a path to citizenship are putting a new spin on a tried and true idea. 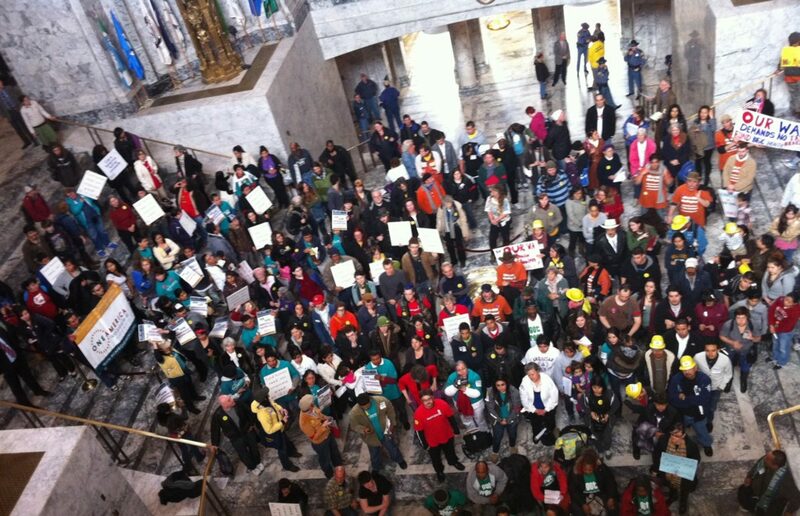 Instead of a boycott, they’re organizing a “buy-cott” to push immigration reform forward. And that’s exactly what residents of Denver, Aurora, Pueblo, Greeley, Longmont, Ft. Morgan, Grand Junction, Durango, Glendwood Springs, Carbondale, Aspen and other cities and towns across Colorado are doing from August 4-10: they’re putting their spending money to work in local businesses whose owners have declared their support for immigration reform with a path to citizenship. 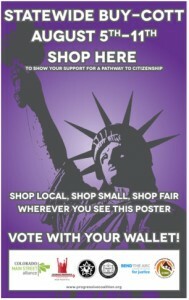 The statewide buy-cott is a joint effort of a range of Colorado-based groups, including the Colorado Main Street Alliance, Colorado Progressive Coalition (CPC), Rights for All People (RAP), Colorado National Association for the Advancement of Colored People (NAACP), Bend the Arc, and Colorado Immigrant Rights Coalition (CIRC). The participating organizations announced the buy-cott with a series of local press events around the state on July 29. The idea has clearly caught on: nearly 400 local businesses across the state have signed on to the effort and put up a poster in their business windows declaring their support for immigration reform with a path to citizenship. The buy-cott has generated lots of local press coverage, too, including in major papers like the Denver Post and in smaller local papers and media outlets across the state. 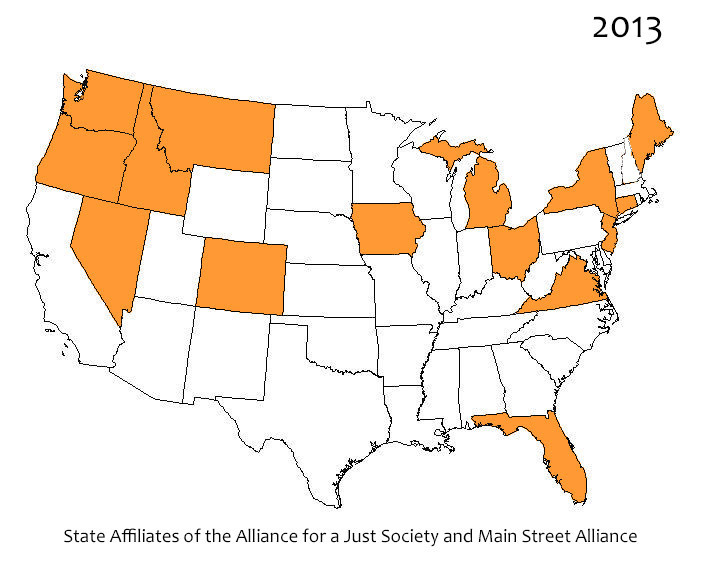 A week ago, to the day, the Alliance for A Just Society hosted our 2013 Summer Conference with all our national affiliates (#Justice2013). There was no better way to kick it off than taking close to 200 participants into Washington DC and hosting three separate actions on the Hill. As of this year, we are proud to note the following states affiliated with the Alliance for a Just Society and Main Street Alliance: Washington, Oregon, Idaho, Nevada, New York, Virginia, Michigan, Ohio, Iowa, Maine, Florida, Colorado and Connecticut. WITH WALL STREET “TOO BIG TO FAIL,” IS MAIN STREET “TOO SMALL TO PREVAIL”? Today, small businesses owners from across the country added a Main Street voice to growing momentum for post-Dodd-Frank measures to end the era of “Too Big to Fail” banking in the lingering wake of the 2008 financial crisis and the Great Recession that followed. As the debate about immigration reform moves from the Senate, which passed a comprehensive reform package (S. 744) on June 27, to the House of Representatives, small business groups across the country are continuing to make the case for common sense, economy-boosting immigration reform.